With summer quickly approaching the search has begun to find the perfect spot to spend those warm days and nights. For those who do not plan on spending every day at the beach, lake, or park, there is no better time than now to create the perfect outdoor entertaining space. Creating the ideal outdoor space seems like it is too expensive and therefore out of reach. However, there are ways to build the perfect outdoor entertaining area without breaking the bank. Here are five ways to spice up your outdoor space. 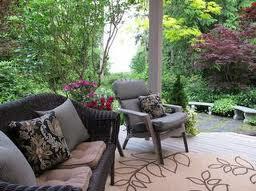 If you have a patio with a cover or that is some-what enclosed try to create an outdoor living room. All you need for this area is a nice patio seating set arranged like in a living room for family and friends to gather around and chat. You could also mount a television to the wall outside to increase the entertainment. If you have an extra television you could look up a cheap way to mount and install it from a website. A finishing touch to tie the entertainment space together would be having a small bar in the corner for easy access to drink refills. Summer is a time for BBQs and fun. Adding an outdoor grill is a great luxury. While it can be an expensive addition, the amount of use it will get will pay for itself. If you already have an outdoor seating area this will be a small addition that will add the perfect touch to those beautiful outdoor days. If you already have a decent backyard set up add some accessories. String some lights overhead or around the fences. Add new cushions to your furniture that are a vibrant color. If you don’t have one, invest in an outdoor fireplace or a built in fire pit. All of these will turn your backyard into an instant party spot any time of the year. Add some decorative cabanas in parts of the yard to add some shade and place the furniture under. Create a world of color in your backyard. Plant exotic plants and trees or put them in pots and place them around your back yard. Create a few flower beds or plant flowers along the back. Nothing says spring and summer like a bunch of bright flowers. This will turn the yard into an oasis. Whether you live near the beach or are land locked, have a pool or not, you can create a tiny beach within your backyard. Turn a small corner of your yard into a beach by adding sand, lawn chairs, a log for sitting, and a small fire pit. Plant a palm tree or two in this area. The beach is literally in your back yard all year long. If you have a beach entrance pool, add some sand before the opening and some trees. Using any or all of these tips will help to spice up your backyard and create a great outdoor entertainment spot for the summer. Create an oasis around a pool or build one up from an empty back yard. Get ready for the upcoming summer with the best and low cost entertainment spot.